In 2000, Congress established a National Moment of Remembrance at 3 p.m.
(Mental Floss) -- Memorial Day is more than just a three-day weekend and a chance to get the year's first sunburn. Here's a handy 10-pack of facts to give the holiday some perspective. The gravesite of Capt. 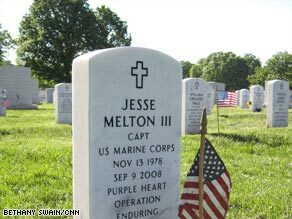 Jesse Milton is seen in Arlington National Cemetery. • Waterloo, New York., began holding an annual community service on May 5, 1866. Although many towns claimed the title, it was Waterloo that won congressional recognition as the "birthplace of Memorial Day." Calling Memorial Day a "national holiday" is a bit of a misnomer. While there are 11 "federal holidays" created by Congress -- including Memorial Day -- they apply only to Federal employees and the District of Columbia. Federal Memorial Day, established in 1888, allowed Civil War veterans, many of whom were drawing a government paycheck, to honor their fallen comrades with out being docked a day's pay. The once-unknown fighter was Air Force pilot Lt. Michael Joseph Blassie, whose jet crashed in South Vietnam in 1972. "The CBS investigation suggested that the military review board that had changed the designation on Lt. Blassie's remains to 'unknown' did so under pressure from veterans' groups to honor a casualty from the Vietnam War," The New York Times reported in 1998. On Memorial Day weekend in 1988, 2,500 motorcyclists rode into Washington, D.C., for the first Rolling Thunder rally to draw attention to Vietnam War soldiers still missing in action or prisoners of war. By 2002, the numbers had swelled to 300,000 bikers, many of them veterans. There may have been a half-million participants in 2005 in what organizers bluntly call "a demonstration -- not a parade." A national veterans rights group, Rolling Thunder takes its name from the B-52 carpet-bombing runs during the war in Vietnam. Rolling Thunder XXII (and you thought only Super Bowls and Rocky movies used Roman numerals) is Sunday, May 24. General Orders No. 11 stated that "in this observance no form of ceremony is prescribed," but over time several customs and symbols became associated with the holiday. Taps, the 24-note bugle call, is played at all military funerals and memorial services. It originated in 1862 when Union Gen. Dan Butterfield "grew tired of the 'lights out' call sounded at the end of each day," according to The Washington Post. Together with the brigade bugler, Butterfield made some changes to the tune. The World War I poem "In Flanders Fields," by John McCrea, inspired the Memorial Day custom of wearing red artificial poppies. In 1915, a Georgia teacher and volunteer war worker named Moina Michael began a campaign to make the poppy a symbol of tribute to veterans and for "keeping the faith with all who died." The sale of poppies has supported the work of the Veterans of Foreign Wars. No question that Memorial Day is a solemn event. Still, don't feel too guilty about doing something frivolous, like having barbecue, over the weekend. After all, you weren't the one who instituted the Indianapolis 500 on May 30, 1911. That credit goes to Indianapolis businessman Carl Fisher. The winning driver that day was Ray Harroun, who averaged 74.6 mph and completed the race in 6 hours and 42 minutes. Gravitas returned on May 30, 1922, when the Lincoln Memorial was dedicated. Supreme Court chief justice (and former president) William Howard Taft dedicated the monument before a crowd of 50,000 people, segregated by race, and which included a row of Union and Confederate veterans. Also attending was Lincoln's surviving son, Robert Todd Lincoln. And in 2000, Congress established a National Moment of Remembrance, which asks Americans to pause for one minute at 3 p.m. in an act of national unity. The time was chosen because 3 p.m. "is the time when most Americans are enjoying their freedoms on the national holiday."